Soft Cover, 142 pages, 5.75 x 8.75. Bert Grant, a legendary figure in the world of brewing, describes his half-century brewing career in the world of specialty beer. Beginning in 1945 at the tender age of 16, and over the next four decades, Grant worked for many of the industry's giants, including Canadian Breweries, Stroh Breweries, Anheuser-Busch, Coors and Guinness. He became internationally known for his expertise in the chemistry and use of hops, the key to making great tasting beer. 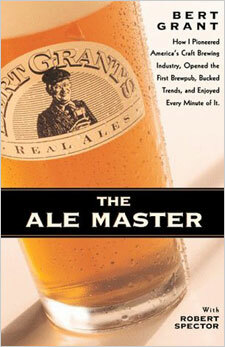 Late in his career, Bert Grant fathered what has become known as the microbrew industry. His five-barrel brewery in Yakima, Washington was opened in 1982, before the public knew what a microbrewery was. His first commercial beer was Scottish Ale, which was and still is unique among American beers. When the brewery opened, it offered limited food service, starting one of the hospitality industry's hottest trends, the brewpub. Grant's was the first brewpub to open in North America since Prohibition. Today, Bert Grant is referred to by his peers as "Dean of America's Craft Brewers." The Wall Street Journal branded Grant "a patriarch of the micro movement." Along with co-author Robert Spector, Grant describes his legendary love of beer, brewing chemistry, and how he defied all odds in the business of beermaking.